Have you ever seen Tanja Berlin's needle painting "in person". It's a dream come true. Each delicate thread well stitched creating almost alive embroidery. And you think "I could never achieve such beautiful embroidery". You are wrong, if you go on Tanja Berlin's website you'll see many examples of needle painting by students. There is hope for us too! The EAC Virtual Threads Guild will host soon the famous embroidery designer and teacher, Tanja Berlin, for the Purple Pansy Needle Painting On-line Class. This project is suitable for all levels of stitchers and is written with the beginner in mind. Needle painting is a surface embroidery technique so there are no worries about having to count the threads of the fabric. 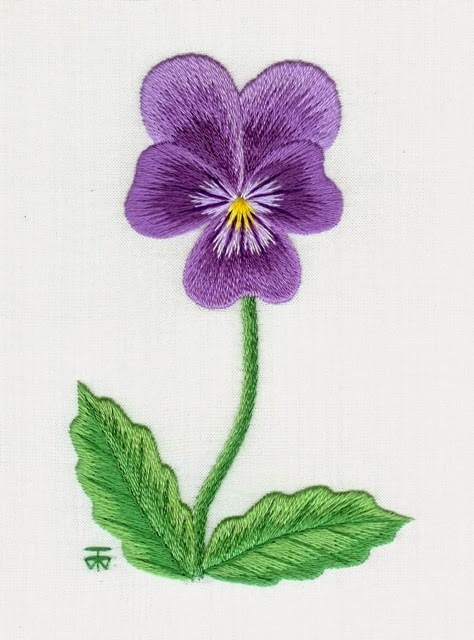 In this fun on-line class learn the method of transferring the pansy design onto the fabric (optional) and then working the embroidery in stem stitch and long and short stitch to create this realistic pansy. The on-line student will receive a pansy kit with a detailed instruction booklet with lots of line diagrams for the pansy. Three separate on-line class lessons will be posted in PDF files. The PDF files will have lots of work-in-progress colour photos and additional tips to work the embroidery. If you are interested in this project, make haste, there are already 5 participants and the registration session ends on December 1st. This will be a wonderful online workshop with Tanja!